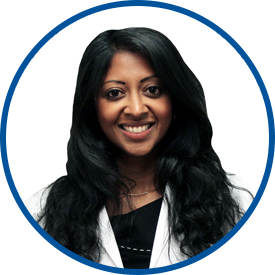 Dr. Varghese is board certified by the American Board of Internal Medicine. She graduated with a bachelor of science degree in the physician sciences from the New York Institute of Technology, where she also earned a master’s of business administration degree. She was awarded her medical degree by the New York College of Osteopathic Medicine. She completed her residency in internal medicine at the University of Medicine and Dentistry, New Jersey, where she was chief medical resident. She was then an infectious disease fellow at Mount Sinai School of Medicine, where she was a co-investigator in several infectious disease research projects. Dr. Varghese is a member of the American Osteopathic Association, the American College of Physicians and the Infectious Disease Society of America. She joined Westmed in August 2014.